I could never get tired of painting that magical light of a glowing sunrise. 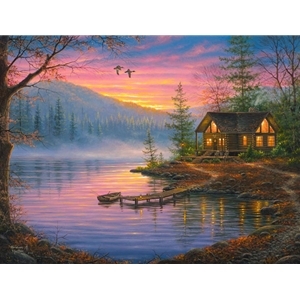 For me, there's no better way to enjoy it than an inviting cabin on a peaceful, secluded lake. In Morning Mist, the sun has not yet completely risen, but the boat is already loaded with poles for an early morning fishing trip. You can hear the whistling of wings as the pair of mallards fly overhead, heading farther up the bay to find breakfast. Its late autumn, a shroud of mist rises from the lake after a very frosty night. The warm glow of the cabin lights seems to take away the chill, inviting you to come sit and take in the the beauty and the tranquility of this golden moment. Get ready! Its going to be an exciting day, filled with the many joys and pleasures that always comes from spending time in Gods creation!